[Compatible with iPhone 8/7/6s/6] MADE FOR iPHONE - This upgraded powerful 3000mAh built-in lithium polymer battery can effectively provide more than 100% additional battery life to your iPhone. Also, it's designed with a female lightning port to be compatible with all your lightning cables. Never worry about carrying extra micro USB cables! DURABLE DESIGN - Made out of a soft, flexible, silicone casing, making it incredibly easy to install onto your iPhone and providing additional protection against daily wear and tear, scratches and scrapes. ONE-YEAR WARRANTY - XDesign provides a one year warranty to protect against defects of your battery case. This powerful 3000mAh built-in lithium polymer battery can effectively provide more than 100% additional battery life to your iPhone. Also, it's designed with a female lightning port to be compatible with all your lightning cables. Never worry about carrying extra micro USB cables! 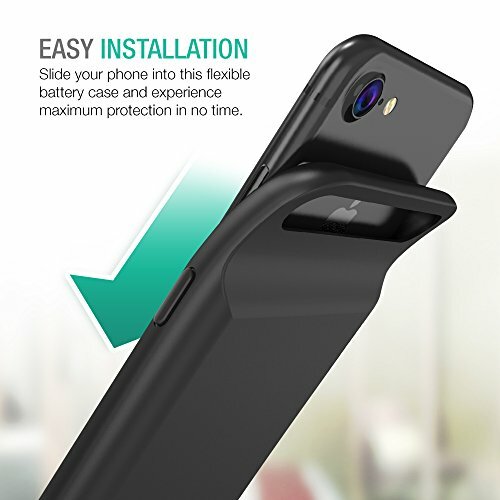 Made out of a soft, flexible, silicone casing, making it incredibly easy to install onto your iPhone and providing additional protection against daily wear and tear, scratches and scrapes. XDesign provides a one year warranty to protect against defects of your battery case.